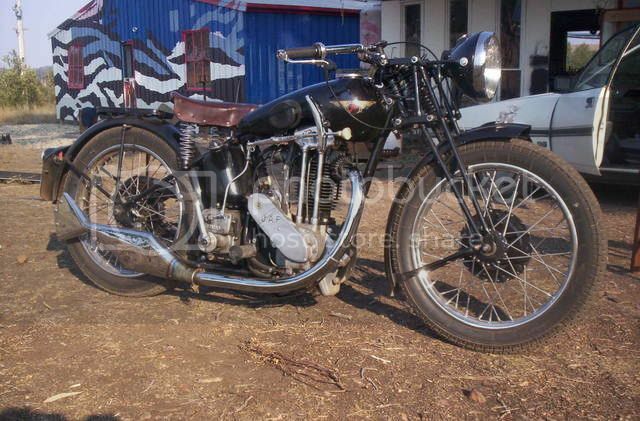 Looking for any info or pictures of Excelsior JAP 500cc TT bikes, in particular 1932 machines. I have got a fair bit of info and a small pile of pictures already, but am unable to find a picture showing details of the missing rear frame section of my bike, which bears a works experimental frame number and has one of the JOR engines made in 1931 for the TT bikes. Any help would be appreciated as I have had the bike for 3 years and still haven't fount the info I need. If you become impatient waiting for parts, just shove the motor into a BSA B31 rigid in the meantime. We did!! You've probably already found this image - 1934 Excelsior TT. Would it be significantly different? For some reason my attempts to "cut and paste" are not working. Do you have the rest of that black and white photo? It seems to have been cut off at the crucial point in that image. Yes I already have pictures from both sides of that bike, I actualy have quite a few pictures of Excelsiors from 1929 to 1934. The picture with Syd Crabtree and the clerk of the course is the only picture I have come across of my bike (I'm confident it is my bike as all other pictures I have show a different frame configuration), hence the ongoing search for more pic's/ info. wilko wrote: If you become impatient waiting for parts, just shove the motor into a BSA B31 rigid in the meantime. We did!! I dont realy want to seperate this engine from the bike as the frame was a one off experiment and the engine looks to be one of about four left. I,m happier preserving it and slowly getting it back together. By the picture it looks like an Albion seperate gearbox you have there. Somewhere in my shed I have a 3 speed (I think) Albion gearbox with the large sprocket in it. No kickstart mech but all the gears are there. Let me know if you are in need of it and I'll try and remember to bring it to Bodmin with me.I believe it came off of an Excelsior but not sure which model. I bought it for my 1933 98cc Ex as I needed the kickstart mechanism for it. A 500cc racing engine would need something a bit stronger. Here's a pic of the gearbox i am planning to use. Still looking for any information or photographs of Excelsior J.A.P's. I'm not getting time to work on this, so the front frame and forks are now going to be sent out for a complete re-tubing. This is where I'll be taking them.